At Advanced Sleep Products we carry complete mattress sets from the following manufacturers, American National Manufacturing, Land and Sky, Somma. A wide variety of Wood Frame or Traditional Waterbed Mattresses, as well as replacement waterbed mattresses for the older wood frame waterbeds. We also carry the complete lines of Soft Side Waterbeds with a conventional mattress look that uses standard bedding and furniture. Waterbeds, Air Beds, and Foam Beds. All of our beds are - MADE IN THE U.S.A. 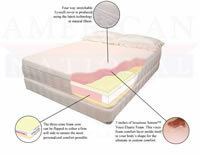 The American National Manufacturing Company offers three distinct styles of soft side waterbed mattresses to choose from, 100% made in the U.S.A. Each offers its unique blend of the latest technologies to provide the ultimate sleeping comfort on either a deep fill, mid-fill, or shallow fill (tube style) waterbed mattress. The Land and Sky Company offers the New Century Collection of deep fill soft side waterbed mattresses to choose from. Each New Century soft-side waterbed mattress is customizable with a choice of seven different water chambers from the NC 110 to the NC 8500 with InnerCoil® design. We offer the Radiance and the Dreamstar tube style soft side waterbed mattresses from Somma. The American National Manufacturing Company offers three distinct styles of wood-frame (hard-side) waterbed mattresses to choose from. Each offers its unique blend of the latest technologies to provide the ultimate sleeping comfort on a deep fill waterbed mattress. Land and Sky offers the Naturalizer and the Impression Series of wood-frame (hard-side) waterbed mattresses to choose from. From a free flow mattress to the Impression 8500 with patented InnerCoil® design the most healthful sleep. Manufactured by Land and Sky our Somma air beds and air bed mattresses have earned the American Sleep Research Institute's (ASRI) Seal of Approval. These highly sophisticated air bed and air mattress sleep systems are specifically engineered as adjustable beds to address the posture and pressure standards set forth by ASRI and represented by our "Stand Tall, Sleep Tall" philosophy. It is important to note that not all air beds and air mattress sleep systems are the same. Somma's air bed mattresses employ a combination of patented technologies such as InnerCoil lumbar support, PerfectPerimeter foam rails, and Visco Elastic Memory Foam to deliver a superior sleep system. Customized firmness electronically with a touch of a button. The reliable one, "You feel the changes." Equipped with American National's Patent Pending three-zone foam core. This three-zone foam core consists of a head zone, a mid body zone, & a foot zone which were all designed to give the proper support & comfort for the different areas of the human body. On top of our foam beds sits 3 full inches of luxurious Sensus™ Visco Elastic Memory Foam. This unique foam responds to your body's temperature & weight, conforming to your individual body shape for maximum comfort & support.